Mazda has to be commended for what it’s done with its own image and cars over the last few years. It has invested heavily in diesel technology while some Japanese manufacturers still ignore it; it’s injected a hell of a lot of goodness into its design, creating a family DNA that is instantly recognisable in any of its cars; but best of all, it hasn’t ignored its core enthusiast base. The Japanese manufacturer still keep our dreams alive; the new ND Mazda Roadster (MX-5/Miata) has hit the nail on the head, and the RX Vision concept is central to the company’s future – as well as many of our own wet dreams. The Roadster shines for its design, sweet chassis and a superbly appointed cabin for the price bracket. Where it fails is performance – especially so in Japan where we get stuck with the smaller 1.5L engine. 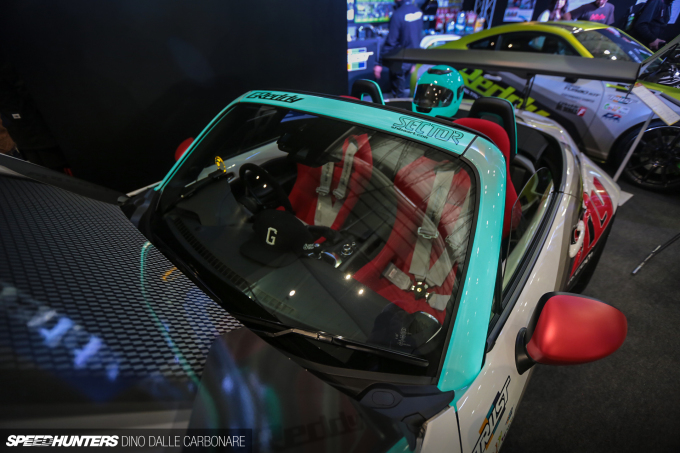 But that’s okay, because like the 86/FR-S/BRZ, the ND Roadster is a superb canvas to work on, and at the 2016 Tokyo Auto Salon it was the star of the show. If I had to choose one example that made the biggest impact at TAS last weekend, it would have to be GReddy’s. 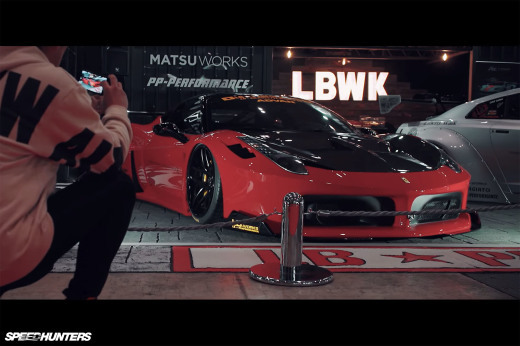 Teaming up with Miura-san at Rocket Bunny, who designed a Pandem overfender kit for the car, GReddy fitted up a set of RAYS Volk Racing TE37Vs and slammed the rear-wheel drive chassis as low as it would go. I love how Miura has been slightly varying his designs lately, and the way the fender flares are styled for the little ND truly emphasises its factory lines. Look closer however, and you discover the main point of this build. Trust/GReddy are putting the final touches to a turbo kit for the little ND that will boost power by about 50hp when finalised; injecting enough boost into the asthmatic 1.5L four-pot to make it crank out more low-RPM torque and a stronger top end, all without creating reliability issues. 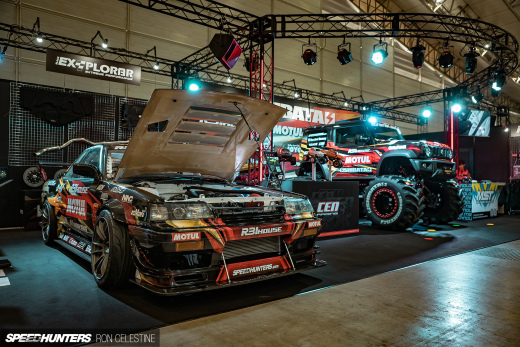 Its top-mounted position takes me back to the good old days of Japanese tuning, and it’s all neatly packaged with the appropriate aluminium piping, intake, and the intercooler we saw two pictures up. 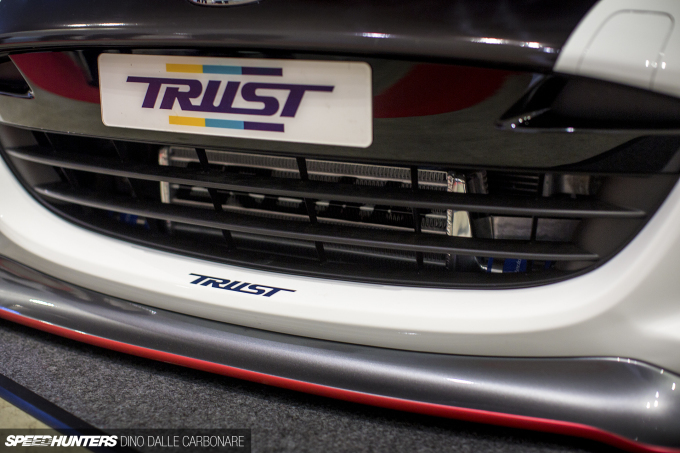 No wonder this ND won TAS’s ‘Best Tuning Car’ award this year! 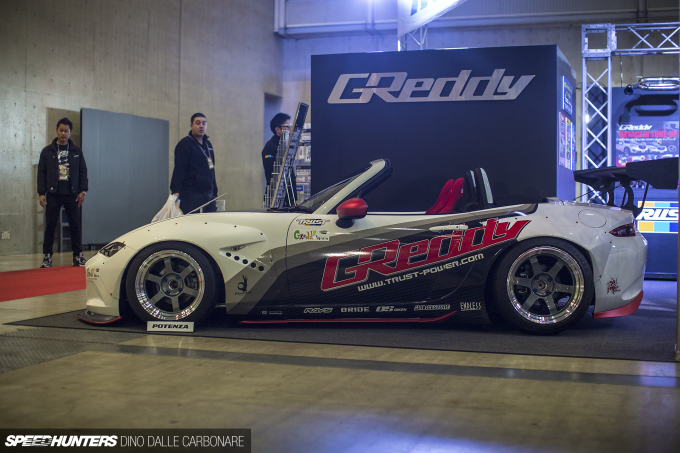 The GReddy Roadster was also showcasing a new type of paint from Shiba Art, which lights up when a current is passed through it. How cool is that?! The special paint was applied to the windscreen surround and the two trims around the roll-over hoops behind the seats, as well as the helmet you can see in the back. 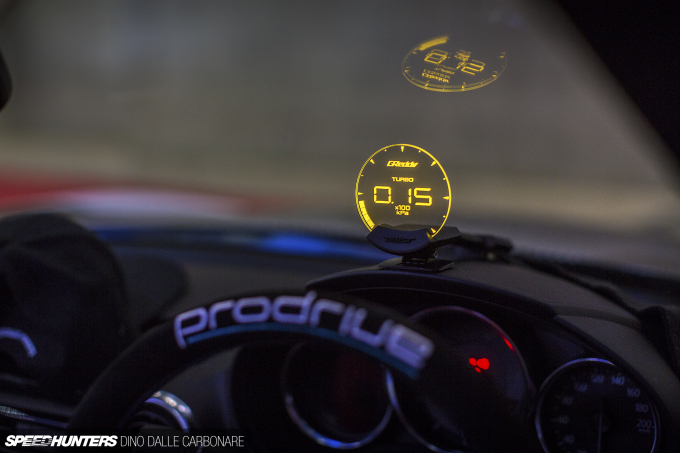 any info on that Greddy HUD? I can't seem to find it on the website!? Ooo that gauge is very good. That gauge is one of the sickest accessories I have ever seen. The 50+ hp should make that chassis a blast too. Great to see some real innovation with that HUD. It's worth wading through the morass of bolt-on fenders to see this. it's a prototype gauge guys; it wont be out for a little while. I'm in love with the car..
that greddy gauge is amazing... will be doing a buy when that comes out! I'd quite like to see this on a track, the livery is pretty cool! I'm so happy this car is real! 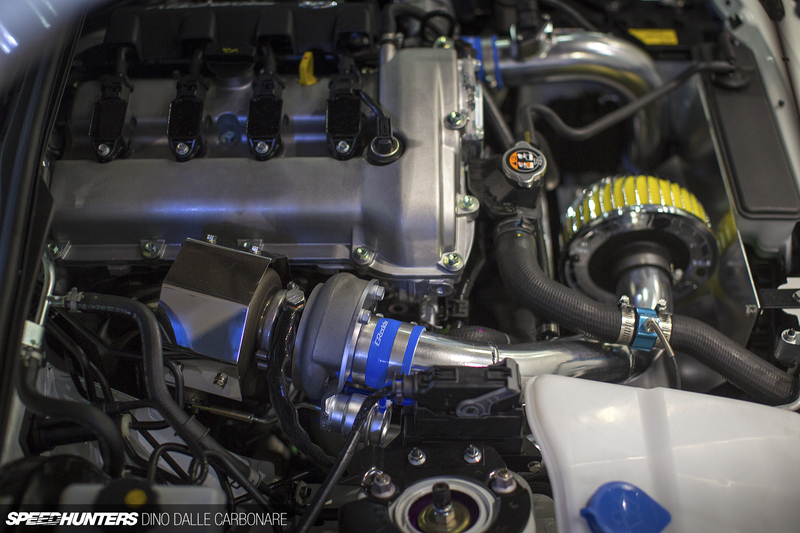 Looks like they tapped the upper radiator hose for turbo cooling? I could be wrong. Cool to see anyways. That HUD gauge is pure genius. No matter where traditional gauges are mounted they require shifting your view off the road to see. With HUD it's less likely to miss a boost spike or lean afr, etc. because its unobtrusively in front of you! I like it, just needs a rotary in it now! Very nice car. That Bodykit, the Engine, that Interior everything is perfekt. One of the things I miss the most about my first S13 was the digital HUD. I was curious when somebody would come out with an aftermarket universal one that was actually usable. "Where it fails is performance – especially so in Japan where we get stuck with the smaller 1.5L engine." Dino, why is this? It always used to be that Japan got the best models and the UK/Europe got the detuned ones, thinking back to the 90s "Grey import" scene in particular. Things have been more even since the the 2000s, so why the change? Truth be told I am not a fan of the Miata, specially the older generations. I can accept this one but would not be on my top 20 of cars to drool over, BUT having seen what's available regarding customizing it starting to grow on me. Looks ten times better than stock, then again when its done right everything looks better than stock. Now I wonder how long it will take before someone puts a boring LS engine in it. 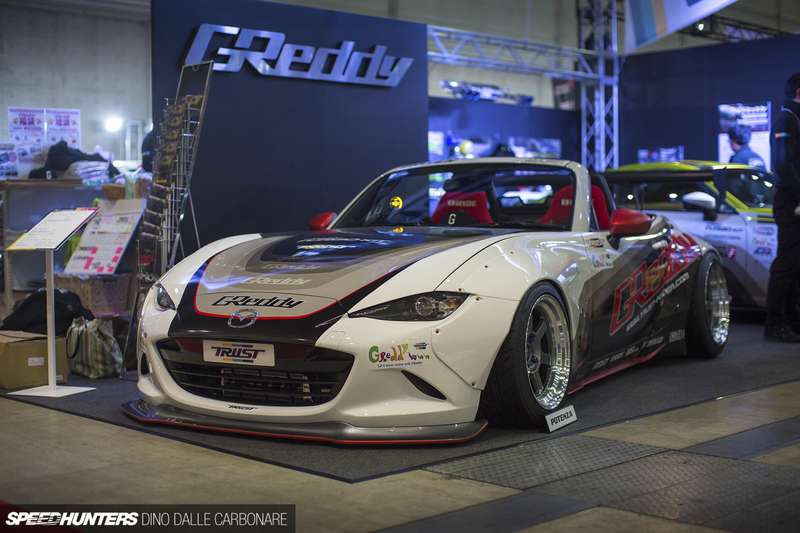 This car is not only a new Miata, it's the new S2000 and even GT86 with the Rocket Bunny kit. A single turbo rotary engine in that woulda made this an instant classic. 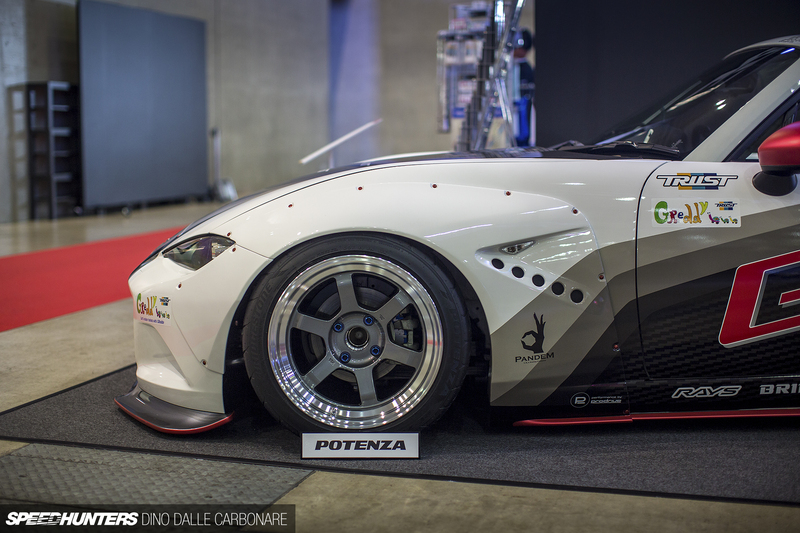 Hope to see a ton of Rocket Bunny NDs in the near future nevertheless! Is there anywhere to get that HUD gauge? AlexGut on paper it's cool to have a rotary but the normal miata owner is not racing or autocrossing and not knowing what it takes to maintain a rotary. Would of made it an instant failure that would be loved from a small audience. Awesome car, awesome writing, thanks Dino! Frieswiththat spec Miata racing is a lot of fun, slow but fun. 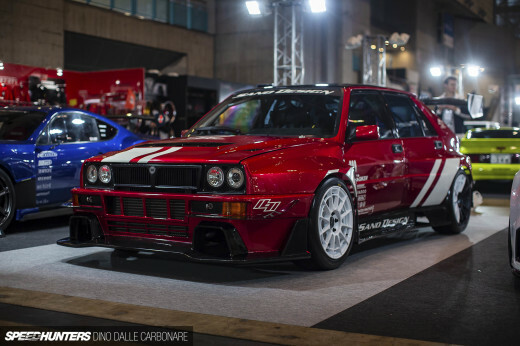 I could see these mods being done if someone wanted to race the car but I agree if it was a daily I donT think I could justify it either. See I agree spec Miata is fun, but why not buy an NA and put 10-12 grand into that instead and have a much more modded machine for the money. Frieswiththat all for that cool turbo gauge man. Nah i dont know i agree with you though, i would rather put the money into and keep it NA. Besides are there even any turbo classes for the miatas? EvolveWRC Corvettes had em for years. Some 240sx, some 1991 Preludes, I've always felt it should be standard for the speedo. Again all the closed minded opinions from close minded people in this world. Most of the negatives are from the broke guys that dream big but don't do anything to gain anything. And the same narrow minded folks most likely never drove nor owned a Miata. I've owned way to make different types of cars, and the Miata is one that deserves some respect. It's not always about making mad power. It's about the drive. 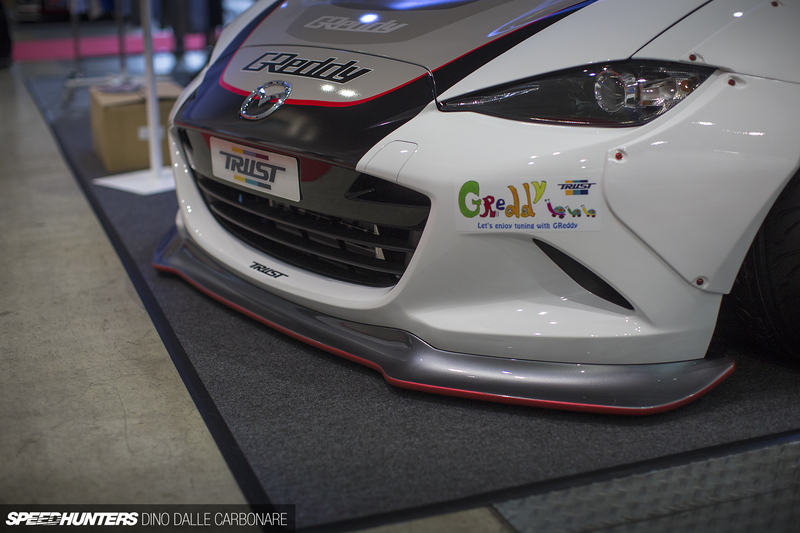 Why FRS' and BRZ's are doing so well with folks? It's about the drive; again. 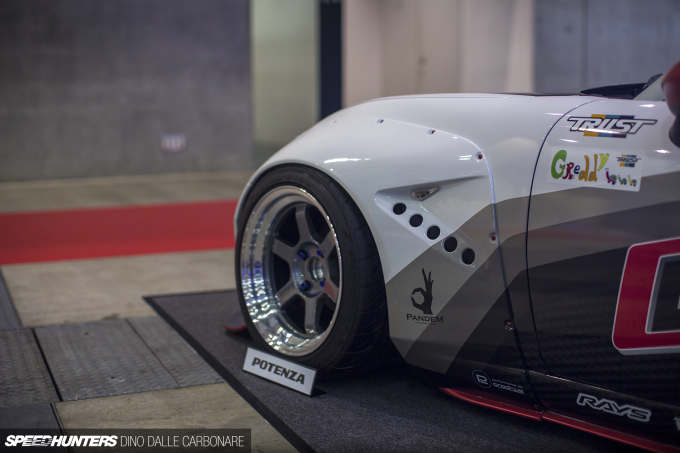 This Rocket Bunny/Greddy Miata is very well done. I've never really been a fan of the MX-5 (and damn near came to hating it when I test drove one last year), so I'm biased against it when I say that I can't see any inkling of sense in spending what I understand to be almost $50,000 on a slammed, turbocharged 1.5L MX-5 with a silly bodykit. For those of an MX-5 persuasion, you could get a BBR GT270 for less than that which looks better without the ridiculous bodykit and has a 36 month, 60 000 mile warranty. or even an actual used (or depending where you live in the world, new) sports car/sedan. Yeah true. Would probably be cheaper to buy theirs anyway I guess. @turbo BEAMS ae86 lol, a little known engineering fact. Also massive rear wing and no front downforce. 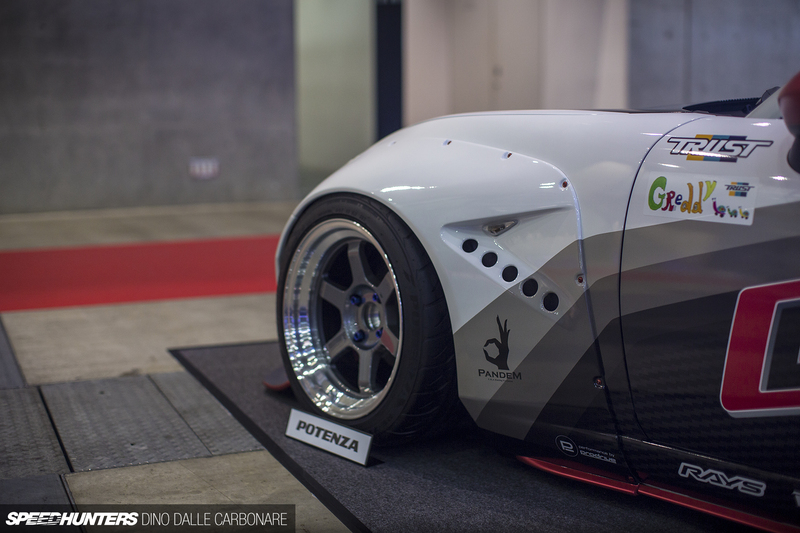 This thing is gorgeous and its a real showcase for what modern tuning is. The electroluminescent paint, sweet HUD and everything else couldnt be more contemporary. I think it deserved the best tuning car given the extent of the work and appropriate modifications, nothing crazy or stupid. I know SH and Rocket Bummy are partners and all but show me what the "everyday" tuned roadsters look like. chiprez You mean like this? Yea. I actually follow that car on Instagram . More info on that gauge! When can i find wings 6666? Mazda has really been doing it right these past few years, even in their financial struggles they are keeping true to themselves while managing the hand they are dealt. The ND is definitely one of the hallmarks of that vision they are moving forward with; making the absolute best of what they can. Good to see the work GReddy and Muira-san have been doing with this platform. And that gauge is just divine, hope to see more of this kind of stuff in the future. Frieswiththat Or an NB. not quite as modified as an NA would be for the same price, but I would fit into it with the top up. 2xthefun AlexGut it would probably be financially unfeasible, but a rotary option (while still offering the piston engines for the less racing-inclined consumers) would have been perfect, to my mind. before you create the next article on the website?